This tour is a very full day, including exploring the magnificent Ikara-Flinders Ranges National Park and Wilpena Pound by 4x4 Highlights include: Wilpena Pound, Bunyeroo Gorge, Brachina Gorge, Abundant wildlife, including yellow footed rock wallabies, emus, kangaroos, eagles and more. Note: visitors to Port Augusta with own transport will need to make their way to Quorn for 8.00am departure - visitors to Port Augusta without transport - we do offer a pick up and return service to Quorn at a cost of $50 each way per vehicle. Departing from Quorn at 8.00am we travel through the Wilochra Plains and learn about the farming history of the region as well as the early train history as we pass by the remains of towns from times gone by. Next we visit the outback town of Hawker before continuing north to the Moralana Scenic Drive - one of the most picturesque drives in the region - with an abundance of kangaroos, emus and birdlife - stopping along the way for morning tea under the gum trees. We continue further north to 4wd through the stunning landscapes of the Bunyeroo and Brachina Gorges and marvel at the amazing ancient geological rock formations including a viewing of the Archeaocyatha Fossil (530 million years old!) and ripple rocks from the ancient sea beds as well as the magnificent views. 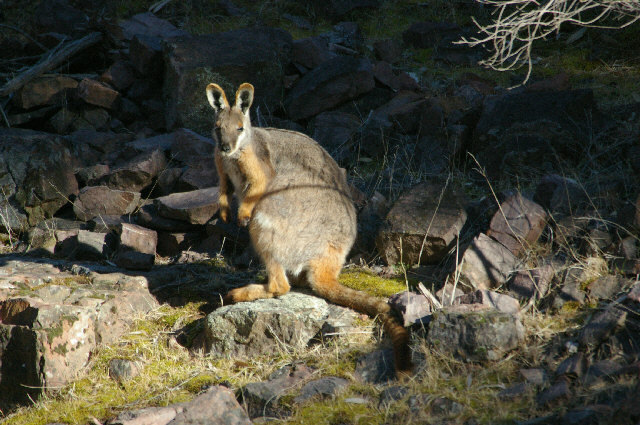 And if we are lucky we may spot some of the endangered species of Yellow Footed Rock Wallaby who call the Flinders Ranges home. Picnic lunch in the Aroona Valley where Hans Heysen stayed during some of his visits to the region. During this tour we will complete a journey around the outside of Wilpena Pound - see its beauty from every side and learn about its formation and history. "We customise our tours to suit your travel needs"